From presentations on poets, pedagogy, entertainment culture and more, this year’s EAPSU (The English Association of Pennsylvania State Universities) conference gathered English students and professors from across Pennsylvania to present their scholarly work under the theme of “Creativity in Times of Crisis.” The annual conference was held from Oct. 4-6. Two students of Edinboro presented work this year — seniors Gianna Leone and Virginia Olds. Leone presented and also won the “Outstanding English Major Award” for her dedication to her schoolwork and craft. “When they first told me, I thought: ‘Wow, really?’ It’s been awesome. I’ve loved my experience at Edinboro and I’ve loved my professors and I’m honored to be the outstanding English major at my last year here,” said Leone. Leone’s presentation was titled “The Arthurian Legends Traced Within Star Wars,” and it broke down comparisons of themes and characters between the two works of fiction. The first part of her presentation focused on the “Star Wars” characters of Anakin Skywalker, Luke Skywalker, and Obi-Wan Kenobi, comparing them to characters from Arthurian legends such as Arthur and Uther Pendragon, Lancelot du Lac, Merlin and the Lady of the Lake. She also explained the parallels of Guinevere and Lancelot’s relationship to Padme Amidala and Anakin’s, as well as similarities between the pentecostal oath and the jedi code, and the fabled roundtable to the council of jedis. Alongside Leone in her session were her fellow outstanding English award recipients, who presented a variety of works on Saturday. Samantha Paine of Kutztown University presented an analysis of masculinity and heroism in poetry works by Housman, Owen and Sassoon. Laura Farley of East Stroudsburg University also presented work on poetry, this time revolving around poet W.B. Yeats and the way Irish folklore and heritage influenced his work. Jessica Armarant of West Chester University presented an open letter about her student-teaching experience and the ways in which teachers can empower students in the face of oppression. Olds presented in a session titled, “Learning/Unlearning Femininity” on Friday with students Meghan Griffin and Logan Henry of Mansfield University. Griffin discussed the moral and behavioral expectations of women in “Evelina” by Frances Burney, “Pride and Prejudice” by Jane Austen and “Mary Barton” by Elizabeth Gaskell. Henry’s presentation about themes of gender and power also discussed Austen’s “Pride and Prejudice,” as well as “The Woman in White” by Wilkie Collins and “She” by H. Rider Haggard. For Olds’ presentation, she discussed the parallels between the original 1985 publication of the dystopian novel “The Handmaid’s Tale” and the 2017 Hulu adaptation. Olds examined parallels in culture between 1985 and 2017, referencing the rise to power of theocratic conservatives, efforts of the Women’s Reproductive Rights Movement and backlash against Roe v. Wade. Three Edinboro professors presented work at the conference, as well. 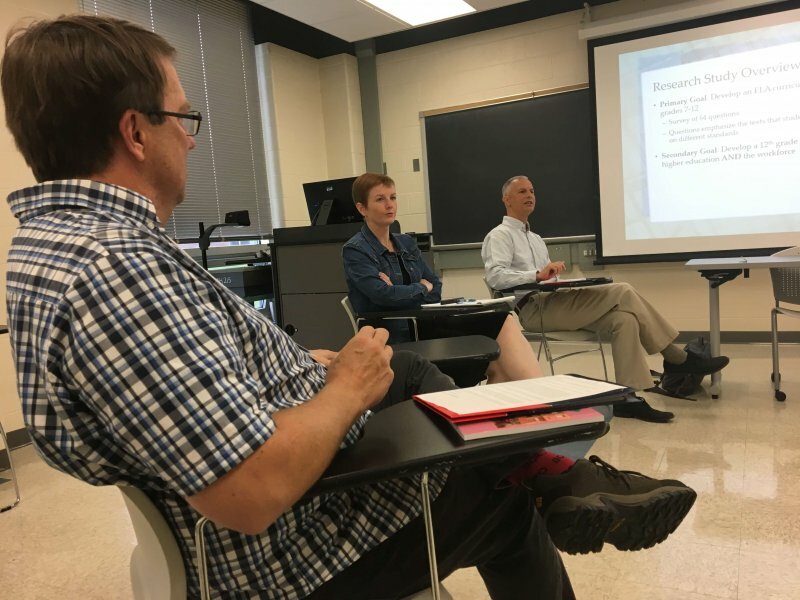 Professor Carrie Campbell participated in a discussion titled “Poetry, Crisis, Community: A Talk and Poetry Reading” early Friday morning with professors from Shippensburg and Lock Haven University. Dr. William Hunter’s presentation was called “A Story of Merciful Racism: History and Metaphor in Jordan Peele’s ‘Get Out.’” He examined “Get Out” to be a retelling of the “Merciful Killing” history of racism in our nation’s past. Hunter pointed to certain stereotypical tropes, such as “slave killings,” “the sexualized black man,” and European views that because Africans were so different, they wanted to make them more like them, eventually stripping them of their identity, just like the transplanting of brains in the movie. Dr. Roger Solberg examined themes within a collection of essays in his presentation, “‘The Hum of Perpetual Noticing’: Themes in the Introductions to the ‘Best American Essays Series, 1986-2016.” His findings? That these introductions often define the difference between an essay and a magazine article, the experience of discovery the author finds through writing essays, and the urgency of sharing your voice during crises and polarizing rhetoric. The loss of Edinboro professor Thomas Lipinski was discussed during the opening remarks before the keynote presentation. The conference hosted poet Patricia Smith as their keynote speaker on Friday night, where she read some of her poetic works and talked about being a writer. Smith has written eight books of poetry, holding numerous awards and is “a Guggenheim fellow, a Civitellian, a National Endowment for the Arts grant recipient, a finalist for the Neustadt Prize, a two-time winner of the Pushcart Prize, a former fellow at both Yaddo and the MacDowell Colony, and a four-time individual champion of the National Poetry Slam,” according to her website. She read poems spanning several of her books, most notable “Blood Dazzler,” a collection of poetry about Hurricane Katrina, and her latest, “Incendiary Art,” which discusses racism and police brutality against people of color. She places immense value on expressing your own experiences and the way the world has affected you, as well as giving a voice to those who do not have one. When Smith wrote about Katrina, she used that same concept to give voice to beings who had not voice at all. The poems she read from the “Blood Dazzler” collection included pieces from the perspective of “Luther B” a dog left behind in the wake of Hurricane Katrina, as well as a poem about Katrina’s family: the other, lesser-known hurricanes of that season. Smith also read poems for Medusa, that speaks from her point of view, “The Romper Room Lady,” who went crazy, and first-lady Melania Trump.